OurSociety Educational Seminars: How do they work? OurSociety is focused on improving the pathway to civic engagement within the U.S. We believe that one of the best ways to do that is to focus on High Schools Seniors. OurSociety Ambassadors facilitate discussion style educational seminars with the intention of fostering a clearer understanding of civic engagement and the tangible benefits of participating in your local communities. We then work with the students to help ideate community improvement projects. Students research, plan and submit community improvement plans or policy suggestions through the OurSociety platform. A few weeks later our Ambassadors return with either the Mayor or an elected Council Member to discuss the submitted plans. We create a full circle educational process that starts with exploring of ideas, thinking of ideas, creating a plan for the ideas, and then receiving feedback and continued discussion about their ideas from community leaders. In addition, some elected representatives may choose to hold discussions about how their Societal Value Matches compare to the students and ask questions to help understand and explore the student’s ideas. 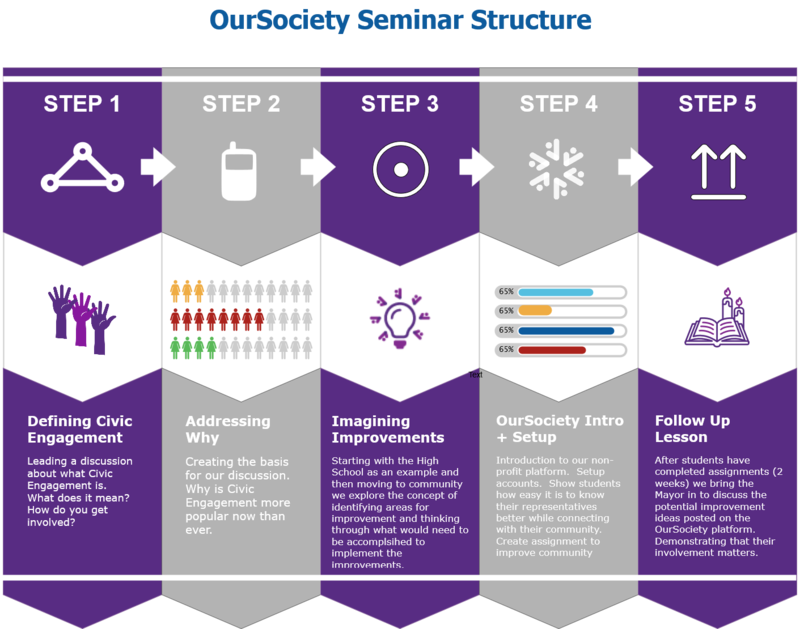 OurSociety educational seminars are designed to show students that their involvement in their community and ideas for improvement matter. Through the OurSociety platform, we empower students to engage through a means of communication that they can easily understand, making the process easier than ever. To learn more about becoming an OurSociety Ambassador click here.